« Blizzard Warning! Do You Have a Snow Removal Plan? When potholes fill with water after a heavy snow or rainfall, it can be hard to identify how deep and dangerous they are. Our first winter blast – Blizzard Jonas – blanketed Maryland and many other states nationwide with upwards of two feet of snow! Now, many of you may be left are re-evaluating your snow removal plan, searching for a new shovel and feeling overwhelmed by the big, not-so-beautiful white and brown piles of snow that have accumulated in the area. As if that wasn’t enough, major snowfalls leave a lasting mark on our asphalt roads – in the form of potholes. 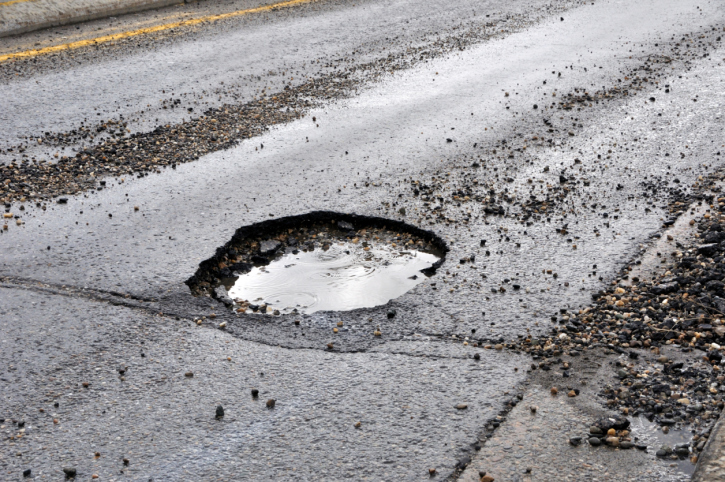 Potholes can do serious damage to your vehicle – accounting for an average of 500,000 insurance claims annually! Let us review some tips for avoiding pothole damage. What Kind of Damage Do Potholes Cause? Potholes don’t just damage your vehicle by skewing alignment and popping tires, they also increase your stress level as a driver. Nobody wants to feel that unexpected loud thump when they are cruising at a reasonable speed. 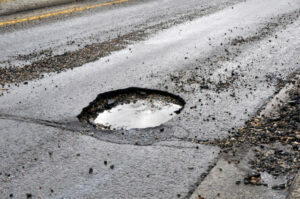 Potholes can jolt your vehicle, making it possible for you to lose control and collide with another vehicle or object. It is always important to leave a good amount of space between you and the vehicle ahead of you for safety in any driving situation, but especially when potholes are present. Keep in mind you do not always know when a new pothole has formed, so it is best to stay alert and do this always. The more space you have to yourself, the more capable you are of safely and calmly dodging the pothole without hitting another vehicle. If you are going too fast, you may not have the proper time to react to a sudden pothole which is dangerous. At higher speeds, your vehicle is at a higher risk for damage when coming in contact with a pothole. If you can’t avoid a pothole entirely, slowly driving over it is going to cause your vehicle a lot less damage in the long run. After heavy snow or rainfall, potholes can fill with water. When the holes are filled with water, you cannot gauge how deep they are and it makes them harder to identify. If you see a puddle of water, do your best to steer clear. This entry was posted on Friday, January 29th, 2016	at 11:27 pm	and is filed under Asphalt, Blog	. You can follow any responses to this entry through the RSS 2.0	feed. Both comments and pings are currently closed.